What Are Succulents and How Do You Grow Them? If you follow me on social media you might have noticed I have a little bit of a new addiction! To succulents! So much so that I ordered a whole flat of plugs from Mountain Crest Gardens last week! 49 succulents to be exact! But what are succulents? No, they don’t give us food. They don’t help the chickens. But succulents do have a whole bunch of other benefits! My favorite being that they just make me happy! You’re probably more aware of succulents than you would think though. Succulents are a plant that stores its water in the fleshy leaves and stem of the plant, rather than continuously drawing from the root system. Some succulents that are more common are cacti and aloe! But they go so much farther than that! The question “What are succulents?” opens a bit of a can of worms! They are ridiculously easy to grow and propagate. But there are so many and they each have their own traits and quirks! Here’s my sum up of the vast varieties of my new obsession! What Are Succulents, and How Do You Grow Them? 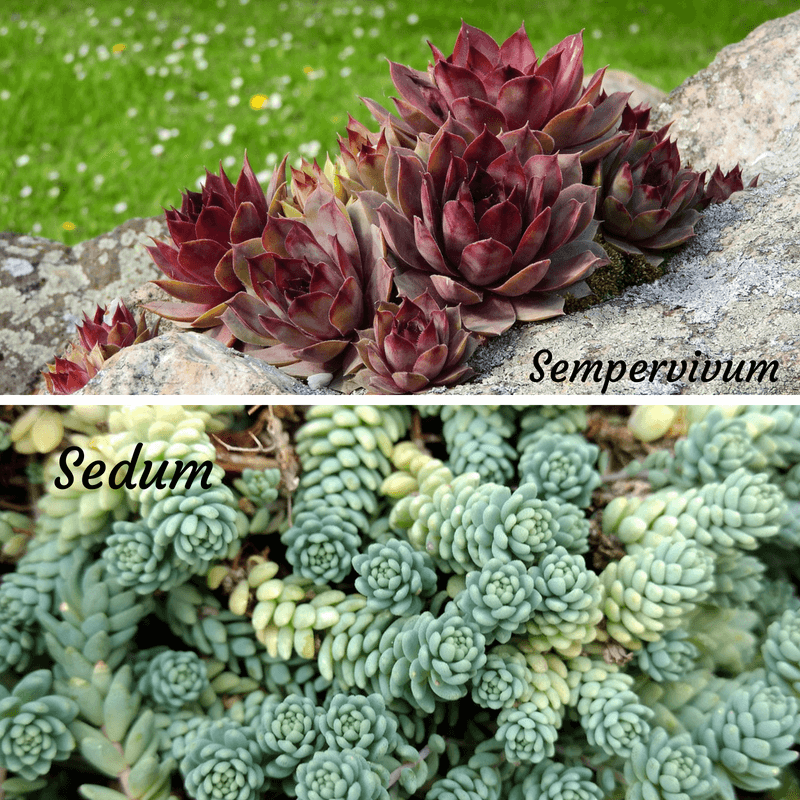 There are cold Hardy Succulents, such as Sedum and Sempervivum (Hen and Chicks) that can thrive in zones up to Zone 5. Not only that, they will grow just about anywhere! With these, I love finding old logs, driftwood, and other odds and ends to design with. I’ve used an old chicken waterer and feeder to fill with different varieties of Hens and Chicks and Sedum. I’ve also used broken pots and an old fire pit! Sedum makes for a great ground cover to reduce erosion as well as block weeds. I also like to use it in a rock wall that Nick built around our fire pit area! The stones were starting to crumble a bit and by building a root system in the crevices it’s helping to hold the wall together, on top of looking beautiful! Sempervivum (Hen & Chicks as it’s commonly referred to) is also great for rock walls and gardens. When you combine the two you can also create living roofs! Living roofs are gorgeous, but also hugely beneficial! They help to insulate for heat and cooling, reducing energy consumption or by helping out our chickens if we were to add a living roof to the coop! They also reduce rain water runoff and erosion! And then there are Soft Succulents that are typically hardy to Zone 9, but make for great house plants for zones above that. 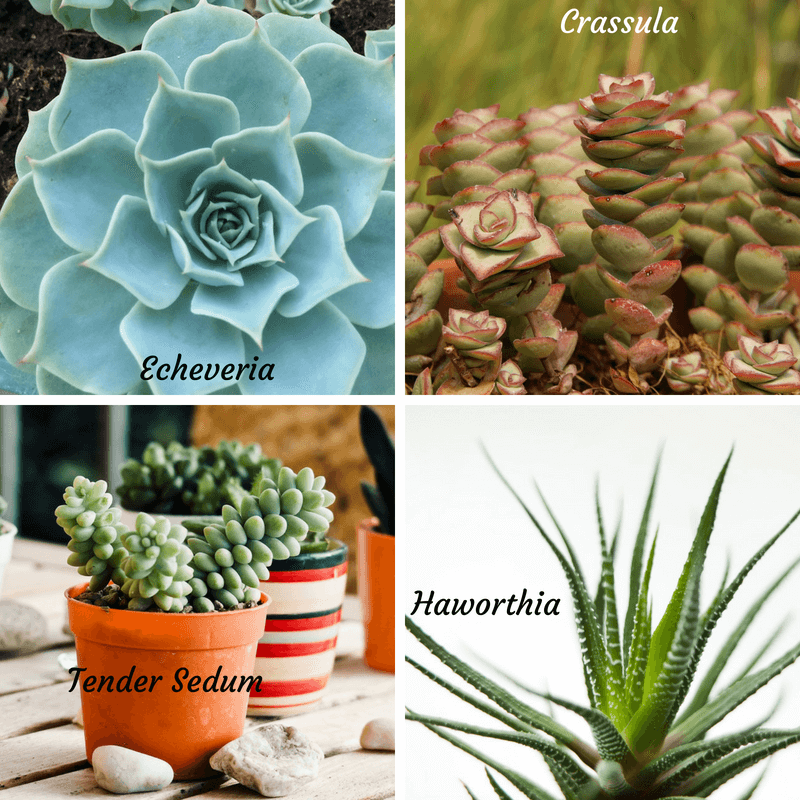 These include Echeveria, Crassula or Jade, Tender Sedum, and Haworthia. The possibilities are endless when it comes to indoor succulents! I have seen birdcages, typewriters, and books. I have personally used vases and planters around the house, a lantern, teacups, and some are so tiny I’ve planted them in corks! Succulents come in all different colors, shapes and sizes! And when I ordered my flat of plugs I ended up with multiples of 17 different kinds! It was so exciting! There are purples, pinks, blues and greens. As far as shapes go there are rosettes and trailing succulents, some branch out, some are spiky and some are rounded! Another thing that makes me love succulents?? They propagate SO easily! And I love free plants! Most can be propagated from a simple leave! But some give off pups (new baby plants attached to the existing) and some you can just take cuttings from a branch of the plant! A great thing about Mountain Crest Gardens is that, if you aren’t quite ready to order that many, you can also order individuals. A great soft succulent to start out with is Echeveria! And if you’re looking for an Echeveria that is super easy to propagate, I recommend Echeveria Prolifica! Then, if you catch the bug like me, you can move into more types and mix and match colors and textures! So, how do you grow succulents?? That again (sort of) depends on whether we’re talking about hardy succulents or soft succulents. Hardy succulents actually don’t need a whole lot of anything! Because the root system is so shallow, there’s not a lot of digging. You just turn up the soil a bit and set them on top. Well draining soil is best, but honestly, I have clay and everything else around here hates it, but my hardy succulents do just fine. After you place your Hens and Chicks or Sedum, water thoroughly. After that, you pretty much just let them go! They will continue to shoot off more chicks, or for Sedum spread. To divide you just pull it up in clumps or individual rosettes and either transplant somewhere else, get crafty with them, or share with your friends! When it comes to Soft Succulents, the question “how do you grow succulents?” is a little bit trickier. Soft succulents aren’t hard to grow. But you just need to remember that less is more! Succulents don’t like to have wet feet, so it’s best to have container with drainage. For soil, a mixture of potting soil and perilite is best. Mountain Crest Gardens recommends one part soil, 2 parts perilite. This is the hard part… We are ingrained to think that our plants are always thirsty. Succulents are not! Like I mentioned before, they actual store their water in the leaves and stem. You should thoroughly water them and then allow the soil to dry out. The top of the soil can be dry for a few days before thoroughly watering again. As far as how much light goes, you’ll want to look into the individual plant, but there are a few good rules of thumb. For the most part soft succulents prefer filtered light. This meaning, if they are indoors a window is filtering the light. If you decide to move them outdoors for the summer, transition them from shade to part shade. They don’t need to be in direct sunlight and can actually get sunburn! Greener succulents can do with less light, but your succulents in shades of purple, orange and red need more. Knowing whether they need more light is easy to tell. They will start to stretch and turn toward the light source. All you need to do is move them to a window that receives more light throughout the day! 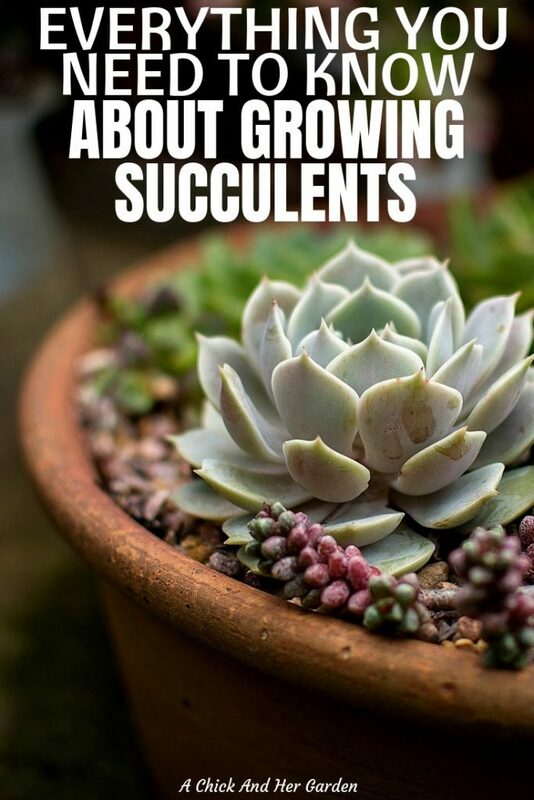 Now that you know how to grow succulents, you just need to get some! Head over to Mountain Crest Gardens and check out all of the gorgeous varieties they have!